Extreme climate events are becoming the norm, rather than the exception. Deluges from Hurricane Florence inundated North Carolina in the U.S. last month. The worst floods in a century ravaged Kerala, India in August. And as the frequency of such events rises, the global loss of life and property mounts, damaging decades of development progress as well. The IPCC’s recently released special report shows that limiting warming to 1.5 degrees Celsius will require major and immediate transformation. The IPCC’s report makes clear that the higher the temperature climbs, the more costly and dangerous the impacts, from flooded homes and deadly heat waves to crop failure and damaged supply chains. And the consequences of climate change fall disproportionately on the poorest and most vulnerable. The IPCC’s report also makes clear that every fraction of a degree of global warming matters–not even 1.5 C is entirely safe. Society will need to continue to learn how to adapt to climate catastrophes. Increasingly, policymakers and development practitioners recognize that unless they take climate change impacts into consideration, investments and progress toward their goals are at risk. Governments, donors and the private sector are now showing their commitment to build climate change adaptation into their day-to-day operations. In a new working paper, WRI sheds light on factors that can help turn adaptation commitments into tangible steps to build climate change resilience. Because the mainstreaming of adaptation into development requires coordination among multiple actors, institutions and processes, the journey from a plan on paper to action on the ground can be slow. A comprehensive review of over 100 cases in developing and developed countries confirmed the persistence of an implementation gap, which can prevent mainstreaming plans and policies from coming into fruition. Hampered by institutional bottlenecks like lack of capacity, coordination and resources, practitioners are often unable to mobilize the sustained commitment that is needed to build climate resilience within communities and environments that need to focus on adaptation now. 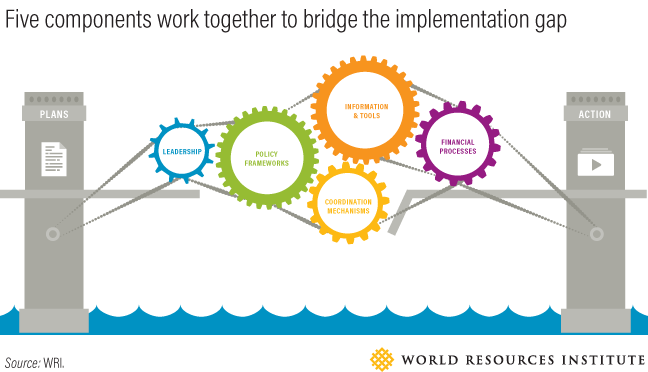 Drawing on published literature, case examples and expert insights, WRI has identified five factors that can work together, like a set of gears, to help accelerate the move from commitments and plans to implementation. Five components work together to bridge the implementation gap. Policy Frameworks or political commitments, mandates, laws and legislation made by the government to mainstream climate considerations into national development plans or sectoral plans. Leadership or initiatives introduced and supported by political leaders, influential ministries and other non-state actors to drive mainstreaming efforts. Information and Tools for mainstreaming climate change, including learning initiatives, training or access to knowledge and expertise. Coordination Mechanisms, such as inter-ministerial steering committees or task forces, designed to support mainstreaming efforts across policy levels and sectors and facilitate public–private coordination. Supportive financial processes, such as expenditure tracking initiatives, budget-tagging efforts, and special funds, set up by government to support mainstreaming efforts. WRI identified several recent examples of successful mainstreaming efforts to highlight how these gears can work in different scenarios. For example, in Rwanda, the mainstreaming dialogue began as early as 2009 through sustained political leadership at the highest level, led by the President and senior ministries like the Ministry of Finance and Economic Planning. Climate considerations were integrated into Rwanda’s national development plan (2013-18) and some sectoral plans. In 2015, the Ministry of Agriculture and Animal Resources (MINAGRI) carried out a pilot to mainstream climate resilience into the production of tea and coffee, Rwanda’s key exports. Both crops are vulnerable to rising temperatures, increasing incidence of pests and diseases, shifting agriculture climate zones and extreme weather events. Using climate information tools, MINAGRI identified and prioritized activities to build climate resilience in the sectors, such as establishing monitoring stations for pests, encouraging intercropping to address climate variability for coffee plantations, and identifying suitable sites for tea production. The country’s political will and policy mandates also helped establish FONERWA, Rwanda’s fund for climate change, which was used to implement the tea and coffee pilot. Lessons from the pilot have been incorporated into Rwanda’s next agriculture plan. In 2001, a regional network was created to build climate change adaptation in the Northern Hesse region in Germany, where heat waves posed a growing threat to at-risk groups like the elderly. With input from the policy document “German Strategy for Adaptation to Climate Change” and with support and funding from the federal ministry, researchers mapped high-risk areas and identified activities that could reduce the vulnerability of affected communities. These included establishing early warning systems and providing recommendations to handle heat stress and reduce health risks. Climate adaptation officers and managers were established at the local level to coordinate activities across the health sector and to educate the public. There is no one-size-fits-all approach to mainstreaming. The gears do not always work in a linear fashion. They may “turn” in different directions, and one gear can often help start or accelerate the motion of others. It is important for policymakers and practitioners to assess the complex mechanics of their mainstreaming processes and consider ways to strengthen and accelerate implementation in their own socio-political environments. Documentation of successful mainstreaming efforts remains scant. As the practice of mainstreaming proceeds, telling the stories of successful efforts can provide insights and inspiration. Lessons shared through communities of practice and case studies can offer new perspectives on how to identify entry points and mobilize the key factors that can accelerate the drive to implementation.